Hanuman, skippered and steered by local ace Ken Read with his brother Brad among the afterguard, stole the show on a spectacular opening day of the first ever J Class World Championship. 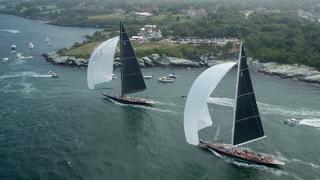 The event is being held on the waters of Newport, Rhode Island where J Class yachts made their America's Cup debut way back in 1930 and where the Reads cut their teeth in competitive sailing. Hanuman led from the first mark around a 20 nautical mile Navigators Course. 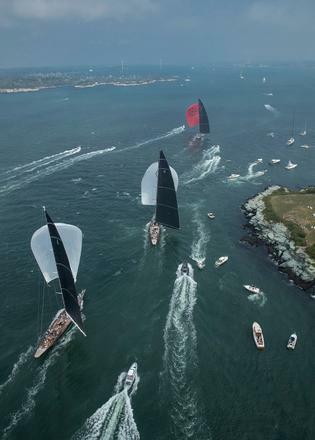 When challenged by the newest J Class yacht in the fleet Svea, which is guided by wily America's Cup Stars & Stripes veterans Peter Isler and Tom Whidden, Hanuman fought back downwind with smooth, well executed manoeuvres. When they took their well earned winning gun, Hanuman was extending into the mist, stepping clear of a spirited scrap over places second to sixth. 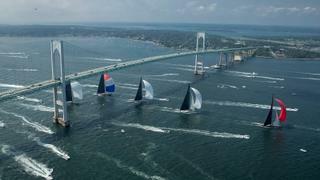 "That was one of the very coolest sailboat races I have ever been in in my entire life," Newport born and bred Ken Read enthused. "Honestly, it had everything: home town, gybing and tacking around all the little nooks and crannies, such a great crowd of boats out there watching. That is what we always hoped this regatta would show, how special this can be, and I am sure it did just that. It was fun and special having my brother Brad on board. This whole team has been working for this for years and also to see the smile on Jim and Kristy's faces today. It was just great." 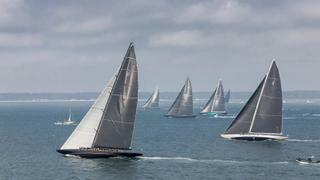 The opening race of the inaugural J Class World Championship delivered it all: spectacle, majesty, close competition over a decent length course, which checked off in turn historical local landmarks made famous over the dozen editions of the America's Cup. There was even a pod of dolphins out to play around the bows of Ranger and Topaz early on the first 3.5 nautical mile beat. 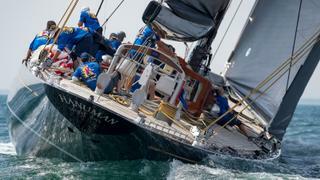 The fleet of six J Class yachts revelled in the perfect flat water and brisk 14-18 knot south-westerly breezes. Places were traded back and forth throughout the fleet from first mark to the last. 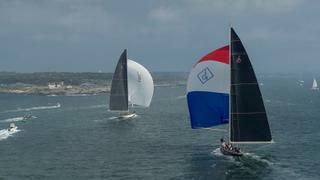 Ranger shut out Velsheda at the windward end of the start line and with nowhere to go Velsheda clipped the signal boat. 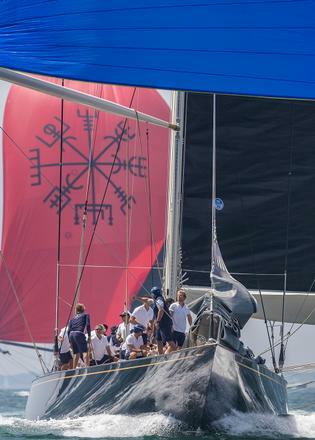 Harrying Hanuman around the first top mark Svea — in just her fifth ever J Class race — split their kite on a botched hoist, forcing them to make their first ever in-line spinnaker peel. "We got out a bit of a jam off the start line," explained Read. "Lionheart has been a very high pointing boat for a while. Being able to hang there until almost to layline was critical for us. And then once we got clear air we let the boat do its thing." For the Svea team, which only put their rig back in the boat just over a week ago after having their Bermuda J Class America's Cup halted by a forestay problem, second place today was a welcome reward. 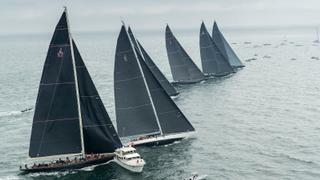 The newest, biggest J ever showed great speed but they are still early on the learning curve when it comes to smooth, effective manoeuvres compared to the teams polished by more than five years of J Class racing. Svea's tactician and project manager Charlie Ogletree commented: "We are happy to get a second and start the series with a good result. We learned a lot today. There was less current down that side, staying close to Castle Rock, we had good local knowledge, some good navigating from Peter Isler. We changed our tactics towards the end to consolidate against Lionheart. Downwind we are quick and upwind we are still learning our modes." 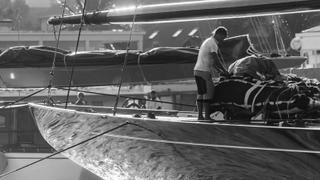 The J Class World Championships continues in Newport today, with the first warning signal at 1100 (EST).